One of the newest smart ellipticals in 2018 that comes with an EKG heart rate monitor. The same elliptical would have been priced over $1500 if it was released in 2012. ProForm 150i Elliptical is the newest addition of the ProForm family in 2018. ProForm 150i Elliptical is a budget home elliptical exercise machine that is suitable as both standalone unit and a part of any home gym. With its moving hand grips and adjustable resistance settings, ProForm 150i Elliptical trainers can be used for both cardiovascular and full-body workout. Moreover, it’s cordless feature makes it easy for you to use it according to your own convenience. You can track and share your progress. 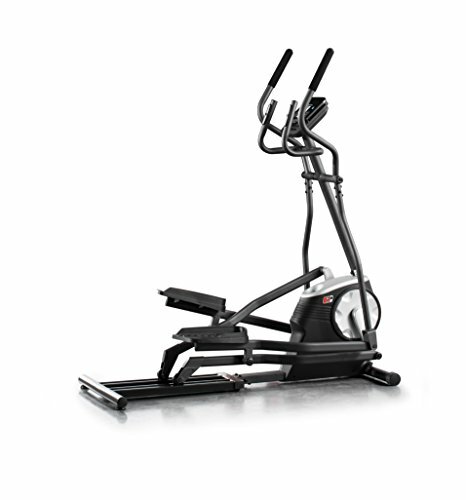 ProForm 150i Elliptical offers 12 various workout programs (with manual mode) and 12 changeable resistance levels. Featuring an easy to use the console, it has the LCD monitor that displays all the relevant information related to the exercise including workout program, resistance level, distance, and more. Moreover, it has contact and Bluetooth chest strap heart rates monitor that allows you to monitor the heart rate while you do the upper body workouts. Apart from this, it is an iFit enabled unit and can pedal both forward and backward with the same resistance. Overall, it is an exceptional trainer performance wise considering the price paid. Featuring an exceptional space saver design, ProForm 150i Elliptical trainer is quite sleek and stylish. The overall unit is very sturdy and works well with all the resistance levels. Irrespective of your weight and height, this machine is designed to cater all your workout requirements. ProForm 150i Elliptical offers you an ideal combination of smooth combination and resistance and works best for your upper body and arms workout. When you purchase ProForm 150i Elliptical, you will be required to assemble this Elliptical trainer. The manual is quite detailed about the assembly procedure, and the assembly might take an hour. All you need is to follow the manual step by step, and you are good to go. But in case, if you find it tough, you can always call a technician for assembly and testing. ProForm 150i Elliptical trainer offers you incredible workout features considering the amount of price paid. It provides you with the several specialized features that will make your workout sessions more interactive than ever. The in-built LCD monitors all the performance, and the EKG heart rate monitor will let you know when it is enough for you. Moreover, ProForm 150i Elliptical comes with a 5-year frame warranty and a 90 days parts and labor warranty.